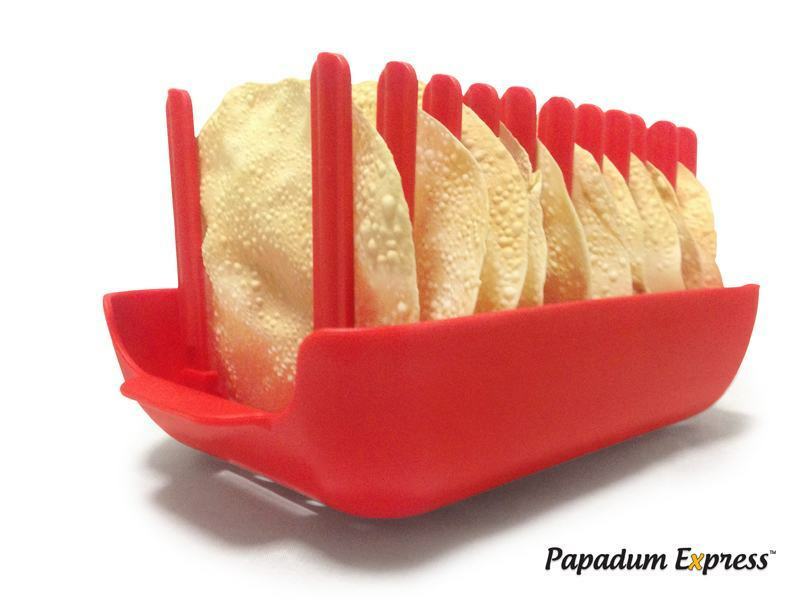 Papadum Express: Cook 10 Papadums fast .. in minutes. Crisp & Crunchy, Oil Free, Fat Free. Easy-to-clean. 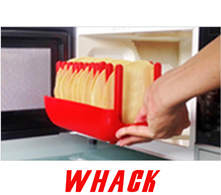 Microwave tray. Papadum or papadam, (Hindi: ??????) (also known as Papad in Northern India or Appadam in Telugu, Appalam in Tamil and Pappadum in the rest of south India; spellings vary) is a thin, crisp disc-shaped Indian food typically based on a seasoned dough made from black gram (urad flour), fried or cooked with dry heat. 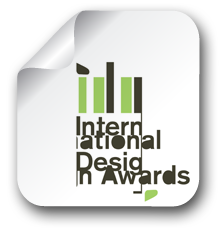 Flours made from other sources such as lentils, chickpeas, rice, or potato, can be used. Papadums or papads are typically served as an accompaniment to a meal in India, or as an appetizer or snack, sometimes with toppings such as chopped onions, chopped carrots, and chutneys or other dips and condiments. In certain parts of India, papadums or papads which have been dried but not precooked are used in curries and vegetable dishes. In Kerala, guruvayoor pappadums are very popular as an ingredient of Kerala Sadhya. In Kerala, people from the Pandaaram caste prepare pappadums. In North India, the lentil variety is more popular and is usually called 'papad'. Alternative names for papadum; papa ?, pappad, papparde, pappadom, pappadum, popadam, pompadum, poppadam, poppadom, appadum, appalum, appala, appoll, papari, pamporo, puppodum, pampad, happala and popper. Papadum courtesy of Wikipedia, the free encyclopedia. What is a Papadum or Papad? A Papadum or Papad is a thin crispy wafer or side dish cracker, which goes well with meals or as a side snack, before the meal is served. Papadums are also known as Papads throughout Asia and by the worldwide Asian diaspora. Many in the west have always known them as Papadums only and never as Papads. Asian communities at large, recognize them by either names, which are Papadums or Papads. The usual condiments served with Papadums/ Papads are coriander chutney, or mango chutney, some chopped salad accompaniments to full meals like rice Pulaos or Biryanis and traditional curries. Be it Asian or non-Asian homes, Papadums/ Papads are a loved and eaten and enjoyed in many homes across the world over. In some parts of the world, Papadums or Papads are flame-roasted by placing them on a hot metal flame rack for cooking just a few inches above a gas burner. Once exposed to the heat, the Papadums/ Papads will automatically cook and expand. This method of cooking is somewhat time consuming, and can also get dangerous. Cooking like this is not for children and the inexperienced due to Health & Safety reasons... Only experienced traditional cooks can attempt this technique of cooking Papadums or Papad cooking. 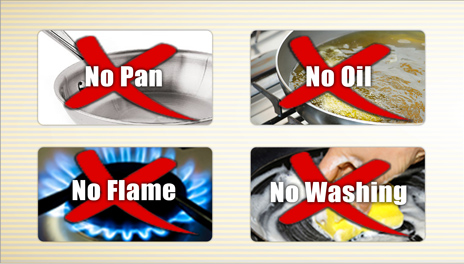 Some others prefer to deep fry their Papadums or Papads in oil. Once in hot oil, the Papadums/ Papads will expand, sizzle and slightly curl up. This method too is very time consuming, as only one or two Papadums or Papads can be cooked at a time. Also, its unhealthy due to excess oil intake. Thus, placing the Papadums/ Papads on a paper towels to remove excess oil is necessary after cooking. It too can get dangerous for Health & Safety reasons. Once again, cooking this way is only for the experienced or seasoned cooks who attempt this technique of Papadum or Papad cooking. It’s definitely, not for children and the inexperienced due to Health & Safety reasons. Not forgetting the amount of cleaning up that needs to be done after all the cooking and feasting is over. This adds to the time allocation for making Papadums or Papads overall. 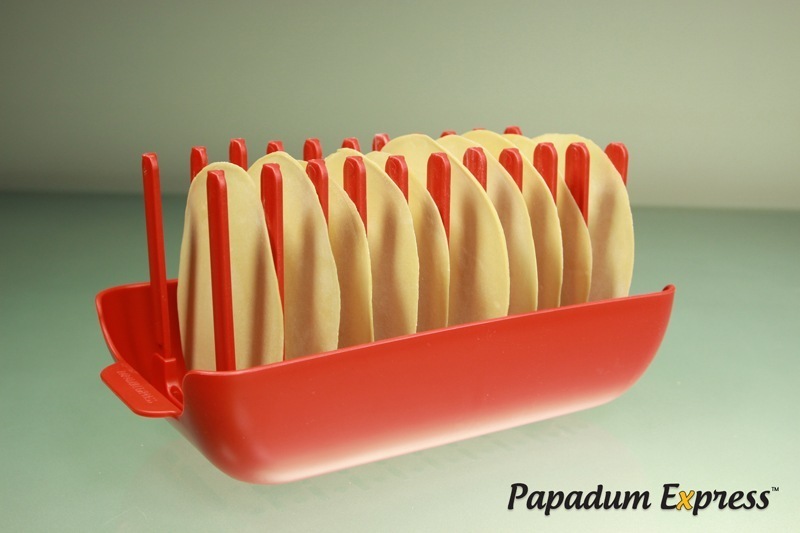 And now, for the world's first multiple Papadum or Papad cooking microwave tray! 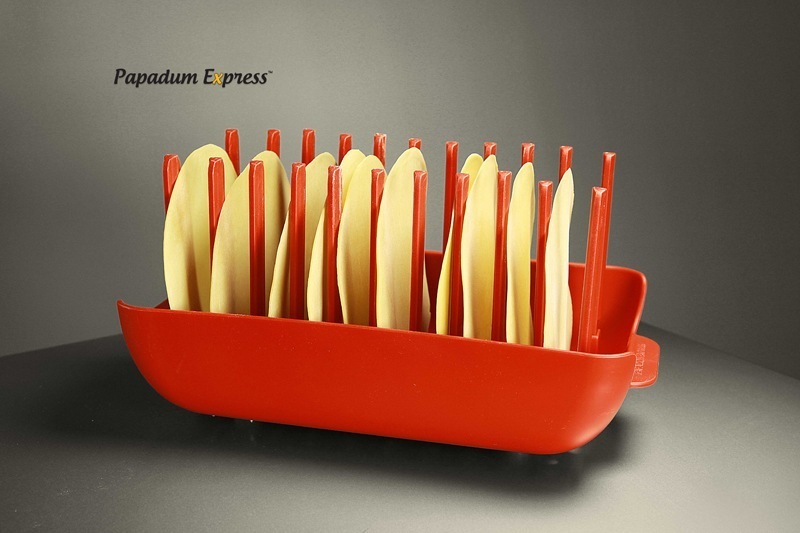 The fastest, cleanest, healthiest and safest way to eat Papadums or Papads is via the use of the Papadum Express: Microwave Cooking tray. Period! 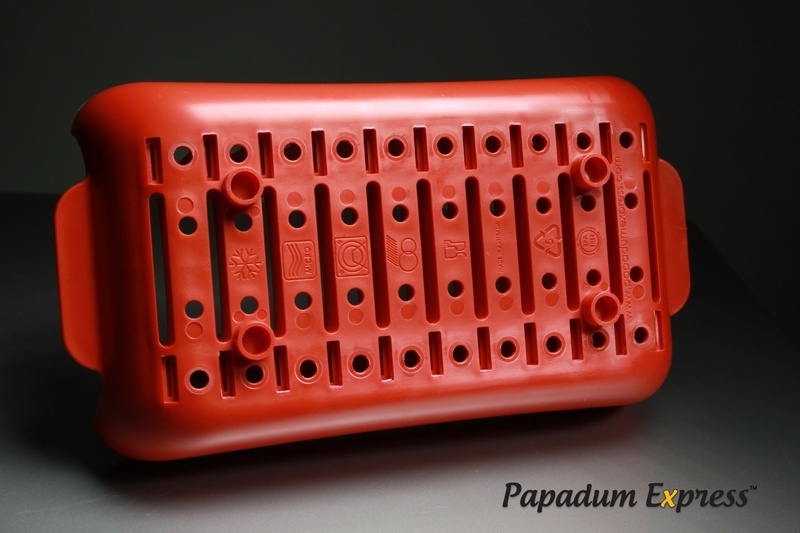 It can be safely used by pretty much anybody who owns a microwave. 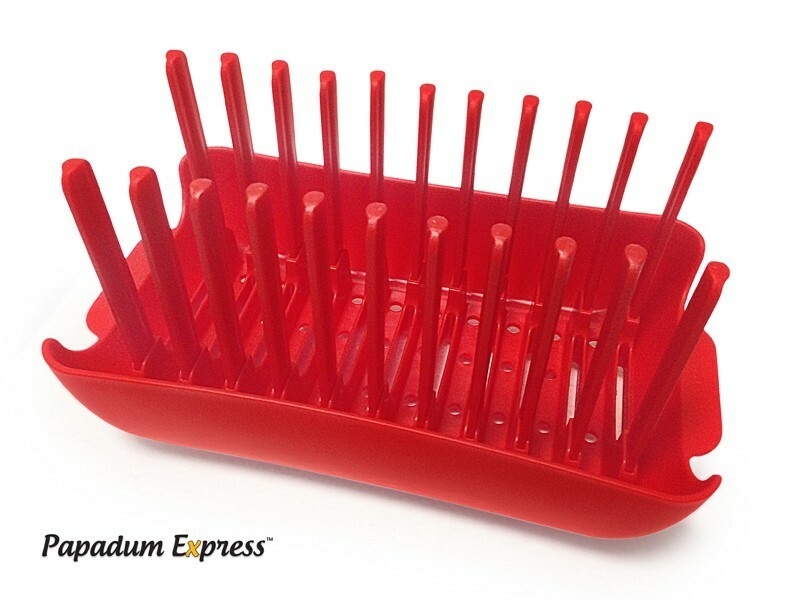 Simply stack the tray with Papadums or Papads, then Whack the tray into your microwave for cooking and serve within 60 seconds, straight onto the table. Papadums or Papads without a fuss or mess or too much effort! Cook 10 Crisp 'n' Crunchy Papadums or Papads fast in minutes. Oil Free, Fat Free and real Easy-to-clean. Ingredients of traditional Papadums / Papads. Traditionally Papadums or Papads are cooked and prepared using black gram bean flour, rice flour, or lentil flour with salt and peanut oil added. These ingredients are made into tight dough and formed into a thin, round shape similar to a tortilla. As the dough is prepared, the papad can be seasoned with a variety of different ingredients such as chillies, cumin, garlic, black pepper, or other spices. Furthermore, papads are also made up of alu (potatoes), sabu-dana, rice, etc. Moong Dal, Udad Dal, Salt, Condiments Edible Oil and water. Plain Papadum, Mix Masala Papad, Jeera Papad, Red Chilly Papad, Garlic Papad, Black Pepper Papad, Green Chilli Papad, Pudina Papad, Methi Papad, Punjabi Masala Papadum, Moong With Pepper Papad, Potato Papad, Swad Papadum, Hot Masala Papadum. Indian Papad, Sharwoods Poppadoms, Patak's pappadums, Akar Rice Papadum or Papad, Akar Urad Papadum or Papad, Akar Rice Papadum or Papad, Akar Urad Papad, Lijjat Papad (Punjabi Masala), Lijjat Urad Papad (Jeera), Lijjat Urad Papad (Plain), Tapiaco Papadum or Papad, Indonesia, Jelly Tapiaco Papadum or Papad, Jalebi Tapiaco Indonesia Papadum or Papad, Star Tapiaco Indonesia Papadum or Papad, Casendra Tapiaco Papad Indonesia Bikaneri Papadum, Urid Lentil Papad Gear, Urid Lentil Papad Round, Indian Peper, Papads, Poppadums Jeera seeds, Sharwood's Garlic & Coriander Poppodums, Sharwood's Plain Large Puppodums, Sharwood's, Plain Poppodums, Sharwood's Spicy Chilli & Cumin Poppodums Ready to Eat, Natco Pappadoms Plain Microwave in 90 seconds, Papad Canapes, Papad Curry, Papad Dosa, Papad in Curd Curry, Papad ki Churi, Papad ki Churi, Papad ki Sabzi, Papad Mangodi ki Kadhi, Papad Mangodi ki Subji, Papad Paneer Crispies. Papad is an Indian appetizer or snack. This food's name is derived from the word Papadum. It is a type of flat bread or wafer. Round in shape, papad may be heated or prepared in a variety of ways. Papads can be made from a variety of base ingredients, which are generally starches. Though internationally esteemed, these wafers or Indian flat breads are particularly popular in northern India. The term for the cuisine was shortened to “papad” in this region. It is one of the most basic and significant elements in South Asian gastronomy. Papad or Papadum is made of one or a combination of the following: rice, flour, lentils, potatoes, chickpeas, or black gram. Black gram, otherwise known as urad or black lentil, is not a true lentil. It is actually a bean. When ground into a paste, the texture or black gram is ideal for papad. In northern India, these crackers are often made from lentils. A lentil is a legume originating in India, like the black gram. Whatever carbohydrate is being used, it is typically ground or mashed and mixed with other ingredients. Salt and peanut oil are typically added, regardless of what else is in the dough. It is generally a protein- and fibre-rich dish. This Indian treat is very aromatic. It may be seasoned with many spices, which emit a great deal of fragrance. Black pepper is a popular choice, as is chili and cumin, which give it a smoky flavour. Garlic is often used, as well. The combination of these spices and those similar are often referred to collectively as Indian spices. After made into dough using salt and peanut oil, the snack is usually fried or roasted. It may also be dried naturally, toasted, or even microwaved. They are crispiest when deep fried, and are most often served this way at Americanised Indian restaurants. Papad is formed into a circular shape, though it’s never perfectly round. It may be small or large. When served as small wafers, papad may be eaten like a chip. If made into larger, softer wafers, it may be used as a wrap to hold other fillings. In this case, it’s more like a flat-bread. Papadums or papads are also enjoyed with lime and mango pickles. The Indian wafers may be dipped into or spread with a variety of toppings or dips. Chutney is a popular choice. A chunky dip made with contents such as fruits, vegetables, spices, and yogurt, chutney is often served with papad as an appetizer before an Indian meal. It may also be topped with basic chopped veggies or condiments. Papadum is spelled and articulated quite differently across the world. There are at least ten spellings and as many pronunciations of the moniker's base word. In many regions, it is pronounced "pah-pur" instead of "pah-pad." Courtesy of Wise Geek dot com. Condiments like sweet & spicy mango chutney and some spicy tamarind (imli) chutney. Serve Papadums with ground chili/garlic/shallots chutney. Some people even prefer dipping sauces with their Papadums or Papads. Another favourite is green spicy chutney, and cilantro with some mint. Hari chutney made from coriander and mint leaves. Red chutney made of juice of tamarind (imli in Hindi) with salt, toasted and ground cumin, dry powdered ginger. Papads powdered with pepper and chillies. People in the South of India love eating chili, cumin, garlic or black pepper papads with most of their meals. The Red chilli & cumin puppodums is served all over England. Traditional Indian recipe - puppodums, sundried in madras for an authentic flavour, and then cooked. Papadum or Papad with lime and mango pulp. Serve Papads with a Bruschetta style salad. Papadum with Apricot chutney and many thick based types of chutney is another form enjoyed around the world. Papadum or Papads with all types of curries is a huge favourite around the world. As we all know, Microwave cooking is fast, quick and convenient. •Factors such as a particular microwave, the microwave age, and the thickness of Papadums being used in a particular microwave, can significantly impact recommended cooking times. Following the microwave manufacturer’s instructions is a good starting point to understanding cooking in it. 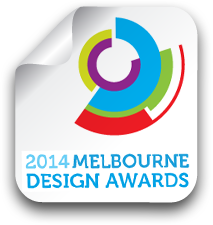 •Due to variation in microwave technologies, microwaves may get hot from repeated use. If your microwave becomes hot, allow it to COOL prior to starting the next batch of cooking. On subsequent batches, shorten your cook times, due to the microwave running internally hotter already. •All microwaves are different and cook times may vary. 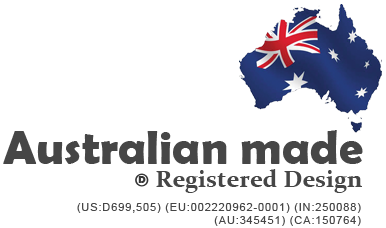 The [USER GUIDE] is a guideline and includes suggested cook times ideal for microwaves with different wattage and power levels. 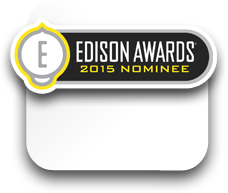 • Most of today’s microwaves are built in 4 categories very small, small, medium or large. 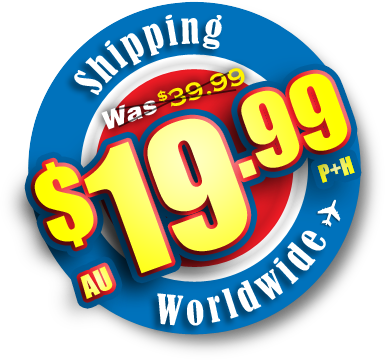 Many of us know them as 800W, 1000W, 1100W and 1200W. 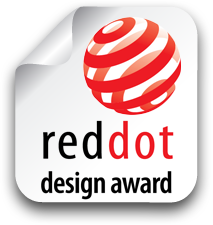 Our goal is to improve our customers lives by providing a simple, but, valuable and trusted experiences with our Papadum Express design technology. 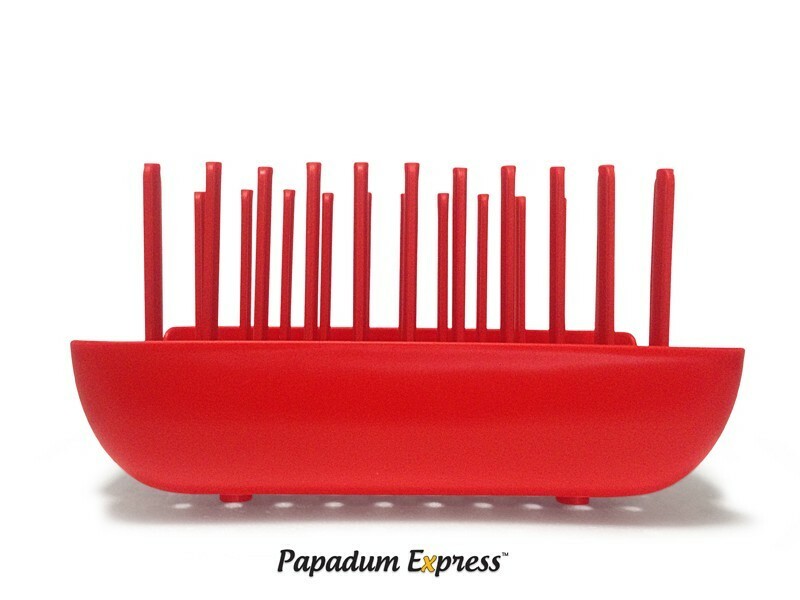 Materials of the highest quality are used to create our Papadum Express microwave tray. 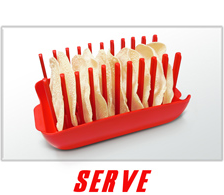 The world's first multiple Papadum cooking microwave tray. 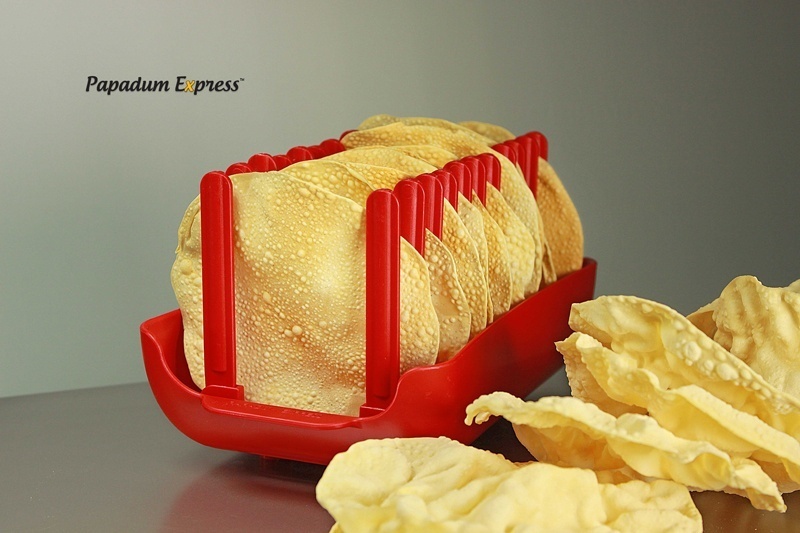 Innovative new design and a high quality kitchen utility Make fast, Crisp n’ Crunchy, Fat free Papadums, Quicker than ever! Two steps: heat and eat! 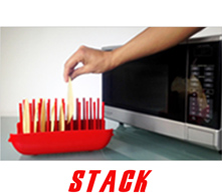 Just - Stack, Whack, Serve onto the table, in minutes. 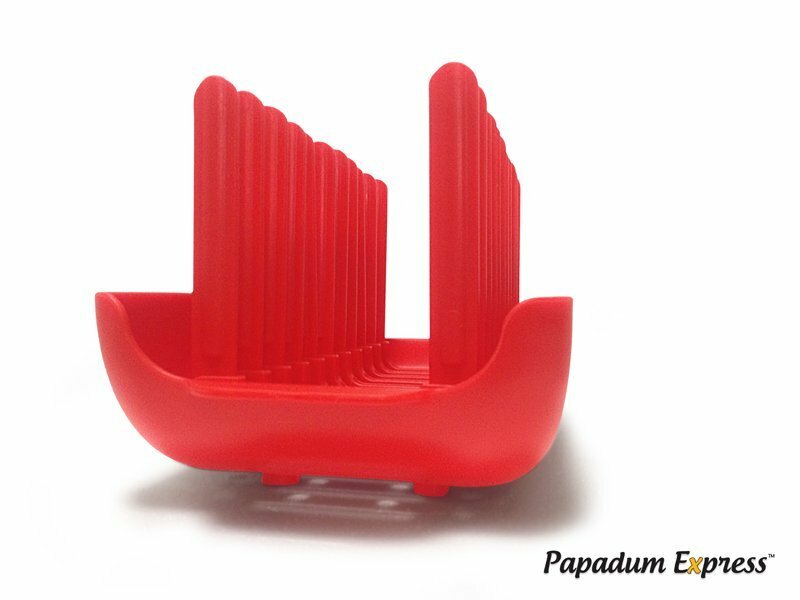 Cook your Papadums faster than ever before! 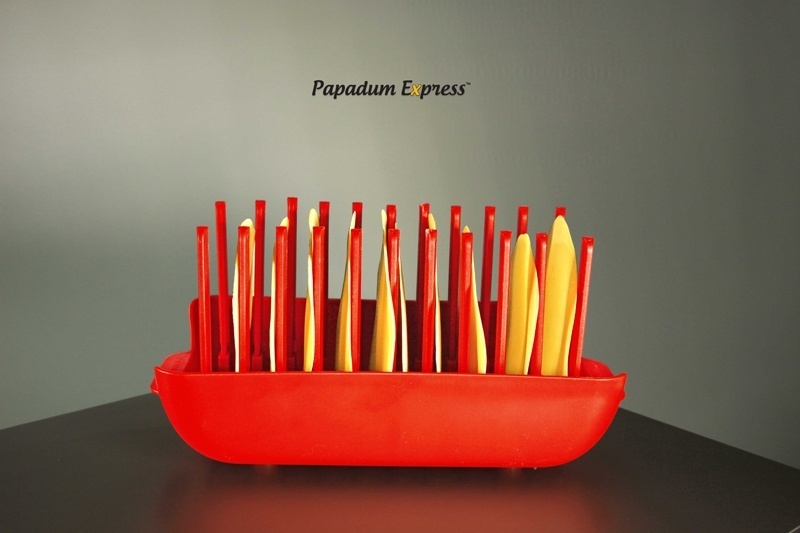 The Papadum Express tray, is ready for quick snacks, family meals, parties and events. Cook Oil free, Fat free - Healthier than fried Papadums. 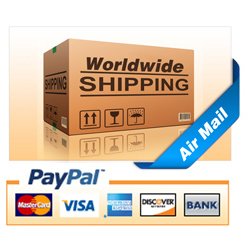 It's also authentic, ultra convenient and just go. go. go. A utility, your kitchen should have! 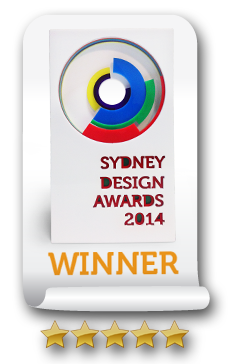 The first in our specially designed Papadum Cookware series. Now, you can make them any time quick and easy, in minutes. Crisp 'n' Crunchy every time. No mess, no fuss just pure Papadums. 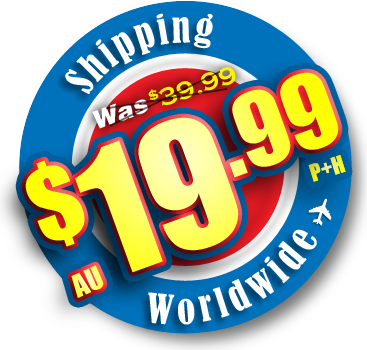 Buy the Papadum Express directly from the manufacturer for the lowest price possible! 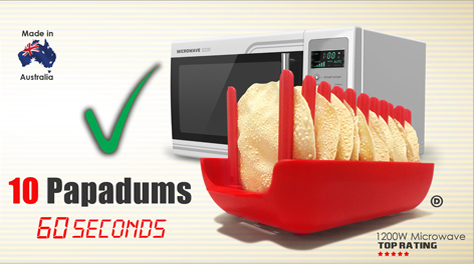 Papadums any time quick and easy, in minutes. Crisp 'n' Crunchy every time. 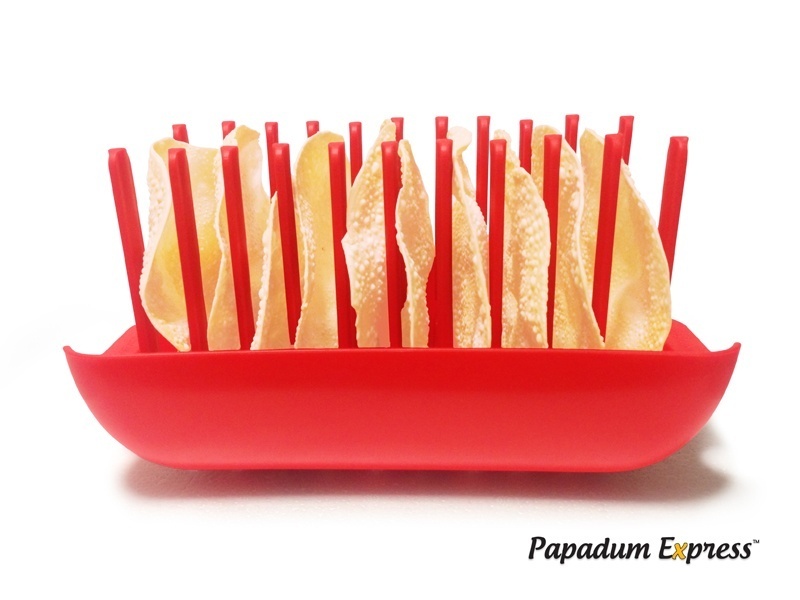 No mess, no fuss just pure Papadums!